When you first looked down at the face of your little babe, there was an instant connection. You likely thought all sorts of perfectly appropriate words: adorable, sweet, maybe even mine. And while we have no doubt that your tyke puts the aww in awesome, there’s a magic little trick that genetics has built into us all! The genetic power of cute ensures that you’re ready to do anything to protect the little bugger. It is a strange work of biology that we’re so attracted to cute little things… otherwise who knows how they’d stay alive! In any event, now that you’ve got the cutest little tyke in the world, you’ll no doubt run into a few others that would like to argue that their weird little creature is cuter.Ridiculous! We see the same fight going on in every other facet of nature, whether we’re looking at the jungle or the urban jungle, the busy city or the down-home farm. Either way, there are a number of cute little animals that we can see in each zone, though, there are a few that aren’t so often looked at as quite adorable by human standards. Among them, the weird little egg-laying hens of the henhouse gets the short end of the stick. It can be awkward and odd-looking, and the jury is still out on whether or not the chick form is adorable or equally goofy. But, this does provide us an opportunity to prove that your tyke is the penultimate of cute and that your adoration goes well beyond mere genetics. Transform your kiddo into the most adorable chick on the planet with this Chick White Rooster costume. This jumpsuit is made of soft and comfortable microfiber terry cloth and fastens with neck ties and elastic. The white hood is edged in orange to create a beautiful beak and has flannel booties with foam chicken toes. 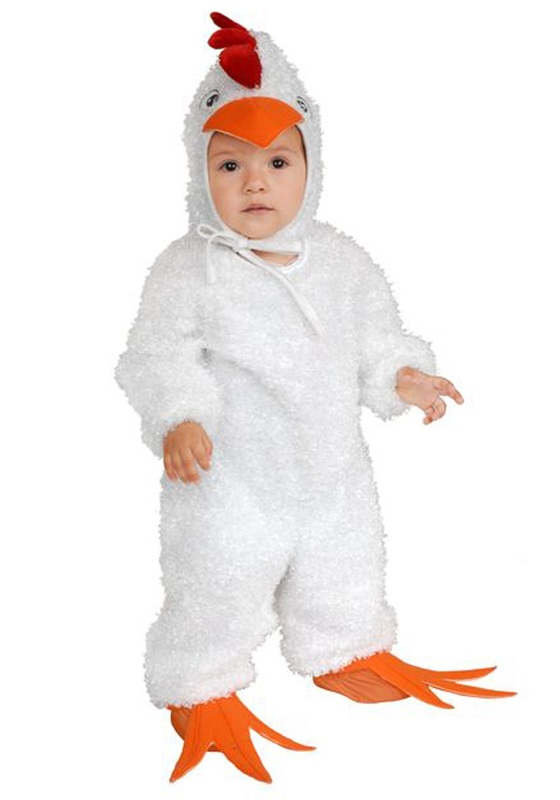 Not only will your kidlet be the cutest on the block, the world will finally see how adorable the li’l chick can be, too!